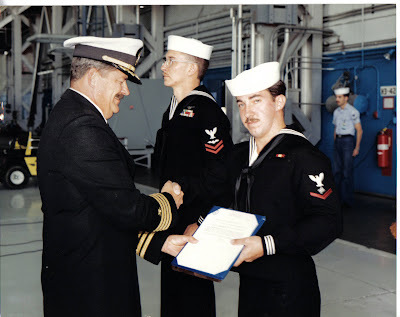 It wasn't long after I arrived in China Lake, CA that I was awarded my first Sailor of the Quarter. I remember this award well because my Department Head was a Search & Rescue pilot and he took me out flying as an additional reward. His crew placed me in a harness and dangled me about 20-30 feet below the helicopter while they flew through the sky. It was really scary at first but after I adapted, it was invigorating. For those of you that don't know China Lake, it is situated near the Mojave desert and it gets extremely hot. Nearby, in the mountains, there is snow during the winter months. Within a matter of minutes, I went from 110 degrees to about 30 degrees. We landed in the mountains, the crew jumped off, and we had ourselves a snowball fight. Those were the good ol' days. BTW You have a Beautiful Family! Hey there! Glad you joined in!! Oh my gosh, I think I would of had a heart attack in the air! But, wow...from heat to snow in a matter of minutes!! By the way, your kid are adorable!! Wow... dangling from a helicopter! Color me impressed. I'm sure you cherished that moment you were in the air! That would have beeen a memorable day. It must have been scary at first. Great picture & it sounds like a fun memory. My husband & I were both in the Army Reserves, he had some interesting adventures at Ft Irwin in the California desert in the late 80's, but nothing like your helicopter ride. Wow this photo flashback is amazing.. Memorable one for you I bet.. Thanks for sharing.. Thanks for linking me here..
You look funny with your mustache Sir john, im sure you laugh every time you see this old photo. You still so young in this one. Dangling from a helicopter?! Wow! It must have been a very unforgetable experience! I couldn't imagine the extreme change of climate temperature over that side of CA. You also look great with mustache!